I have been working with Fahad Hizam and Abdul-Aziz Al-Yaeesh, two drivers from Saudi Arabia who are racing in this years V8 Lumina-CSV Championship in the Middle East. The series races on various configurations of the Dubai and Bahrain Circuits. Initially my coaching was rather unique in that it was all cariied out remotely via onboard data-analysis. I initially made contact with Fahad via a web forum and after various conversations I agreed to help them improve as drivers and also to advise and assist them in racing in the UK. 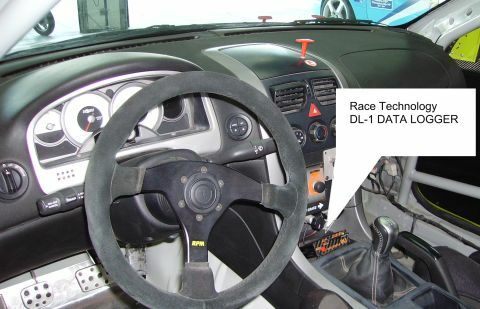 They bought a Race Technology Data Logger (DL1) each and data would be sent via email to me, I would analyse it and advise on any improvments I think they could make. Initially I only had Fahads data to work with which was not as useful as having both drivers. Abdulaziz had been the most succesful of the 2 drivers generally finishing 1st or 2nd or DNF'ing. He was lieing 2nd in the Championship 19 points behind the leader. Fahad who had proven himself quick in Single-Seaters had struggled with the big V8s and was generally finishing 6th or 7th and some way behind the pace of those in front. With some help from the data-analysis we were able to improve Fahads pace which led to his highest place finish (5th) of the season and his pace was getting closer to those in front. Finally in late Jan, having set the data logger in Abdul-aziz's car to start automatocally, we got data from both drivers, with this we were able to make some significant observations which helped the drivers in the race. This helped Fahad to repeat his best finishing position and again the gap between him and the pace-setters was getting smaller. Abdulaziz gained a 2nd and a 3rd (after an incident dropped him to last place). Unfortunately his 3rd place was taken away from him as he was adjudged to have contributed heavily to the earlier incident. Abdulaziz was now 23 points behind the leader and his title chances were looking slim with just 2 race weekend to go. Luckily this coincided with the two of them coming to the UK where I took both drivers to Silverstone GP and Snetterton for some in-car training where both drivers showed some improvment. So, we went into the penultimate race weekend at the Bahrain International Circuit with all to play for. I had been asked to attend this race meeting to support both drivers which I did, this being my first visit to this part of the world. 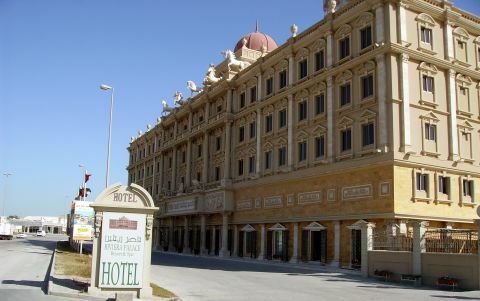 Firstly I have to say I have rarely received such a warm welcome as I did in Bahrain. The hospitality shown to me was fantastic and the facilities, as you might imagine from such a new F1 approved circuit, where excellent. The circuit. In front is the 1/4 mile dragstrip, a unique feature of this circuit. The weekend began with a 30 minute practice session on the Friday morning. The drivers were both a little dissapointed with there time and Fahad in particular was struggling to put in practive what he had learnt in the UK. The cars are a real handful, 400bhp, very heavy with very soft (by racing standards) suspension. The cars are effectivley the same as the Vauxhall Monaro VXR. There seemed to be no subtlety in the throttle response and whilst we had spent lots of time in the UK learning to balance the car on the throttle it was virtually impossible with these cars. Never the less we did have quick access to the data and were soon able to highlight areas for improvment and both drivers went out in qualifying with renewed optimism.